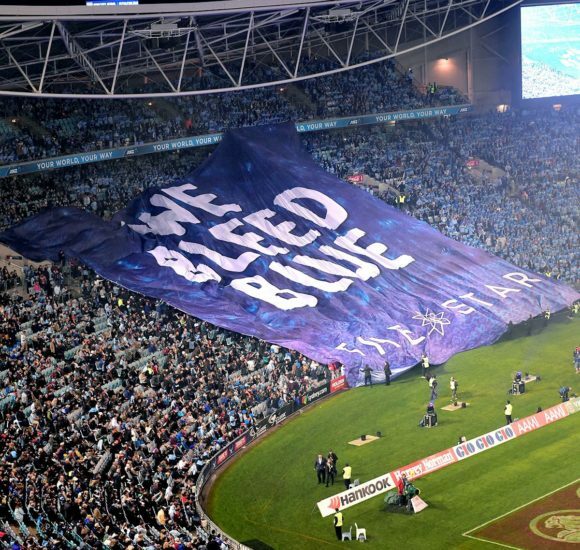 With over 4 million people tuning in to watch Origin Game 1, it is no wonder corporate sponsors put aside huge wads of cash for sporting sponsorship every year. However, the proliferation of social media has perhaps been the biggest game changer for sporting sponsorship in recent years. Sponsors are not only given a platform to communicate directly with their customers, they are also given an excuse to communicate with them, engaging with them in a cultural rather than corporate way. How many sponsors can you count in this video? “Before sport consumption was unilateral: allowing spectators just admiring “the show” without any further engagement. Social media introduced interactive character to the global sport participation” – Optimy. Social media has also changed the way Sponsor’s are able to directly assess the effectiveness of their sponsorship with specific partners. We analysed the Facebook pages of 28 Origin Sponsors, looking at over 896 posts and 206, 890 interactions and here is what we found. Of the top 10 Most Engaging Sponsor Posts, 3 of the top 5 posts directly referred to the State of Origin/State of Origin Players. 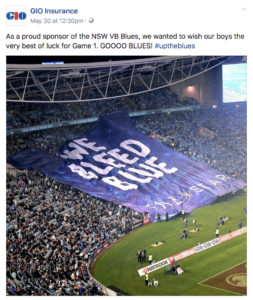 Across all Sponsor Posts, we could see that posts that identified with the NSW Blues, earned higher rates of engagement than posts that mentioned the QLD Maroons. Taking out the top spot, for the Most Engaging Post was GIO Insurance with an Engagement Rate of 25.06% compared to the competitor ER Average of 1.25% and a 2,380 total interactions! 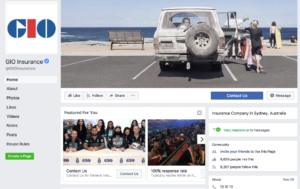 Not only did GIO Insurance have the Most Engaging Post for any Origin Sponsor, they also had the most overall Page Engagement, with an ER of 11.07% compared to the competitor average of 1.25%. GIO also saw higher levels of growth, with a Growth Rate of 3.05% compared to the competitor average of 2.53%. The potential social media plays in sponsorship has great potential. The platform’s ability to allow sponsors to communicate bilaterally with consumers, can lead to greater brand affinity, loyalty and engagement – as we can see with GIO. Social Status recently conducted an ‘Australian Higher Education Industry Facebook Report’ where we analysed 1,499 Facebook Posts from 40 Universities to discover what’s working in the world of higher education. The results were interesting, and it seems some university social media teams are ‘down with the kids’ more than others. Perhaps one of the more interesting examples of this is James Cook University. With just over 57K followers, their fan base is considerably smaller than other universities. 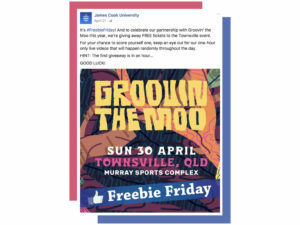 However, an understanding of their target audience meant that a clever 1-day campaign consisting of 3 posts was the winning formula for interaction success. 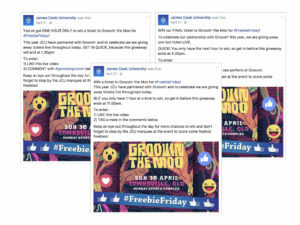 On April 21st 2017, James Cook University launched their Facebook Campaign to win Groovin’ The Moo tickets with a static image announcing that the competition would be taking place throughout the duration of the day. The conditions meant that audience members would need to stay active on their page throughout the day while waiting for the Live Videos to enter – a mechanism which built hype and excitement around the campaign. The like and comment-to-win entry mechanic is popular when the ad objective is engagement as we saw in this campaign. This mechanic attributed to the 8K comments received across the three posts as well as a 129.5% Comment vs. Reactions Ratio (average for competitors was 21.8%). Rather than using static assets, all three competition posts were in the form of a looping Facebook Live video. 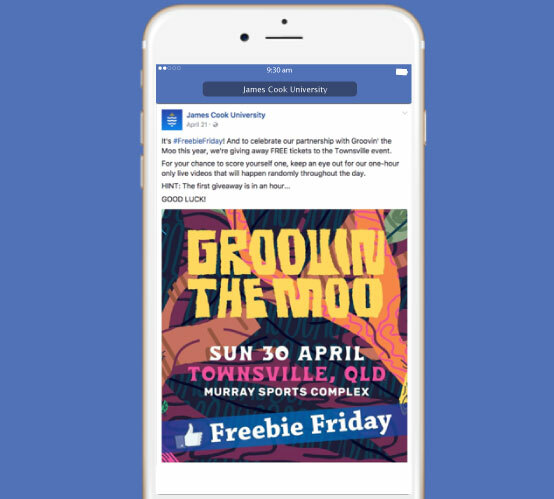 With users commenting on Facebook Live videos at 10X the rate of regular videos, this media form attributed to a significantly larger viral audience reach to JCU’s 57K followers, resulting in 28K views across all three posts. Perhaps the key to this innovative promotion was the 1 hour time intervals. This created a sense of hype and immediacy to the audience, and exploited viral engagement.